GITS > News > Placement > CAMPUS DRIVE OF COLLABERA SERVICE PVT. LTD.
GITS is organizing the Campus Drive of Collabera Service Pvt. Ltd. for B. 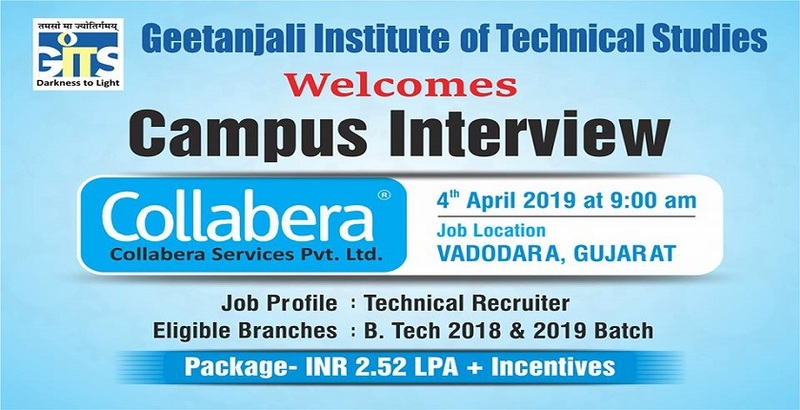 Tech 2018 & 2019 Batch Students @ Package of INR 2.52 LPA + Incentives on 4th April 2019 at 9.00 am. Collabera is ranked among the top 10 Information Technology (IT) and professional staffing firms in the U.S., with more than $600 million in sales revenue and a global presence that represents approximately 15,000+ professionals across North America, Asia Pacific and Europe. We support our clients with a strong recruitment model and a sincere commitment to their success, which is why more than 90% of our enterprise clients rank us amongst their top three staffing suppliers by performance. They have been recognized by Staffing Industry Analysts (SIA) as the “Best Staffing Firm to Work for” – seven consecutive years since 2012. Collabera provides services such as staff augmentation, managed services and professional search services to Fortune 500 corporations across the globe. Awards and Recognitions. • Review the job description; understand the requirements of the clients and accordingly execute a search plan for identifying potential candidates to fit the requirement. • Scheduling, coordination and ownership of end to end recruitment cycle. • Build strong candidate relationship & credibility to leverage their trust for getting referrals. • Submitting candidate’s resume to the hiring managers for further scrutiny or consideration. • Timely communication with the candidates and keeping them posted with updates on their candidature. • Engage regularly on an ongoing basis with the candidates through email, voice & video calls. •An initial salary of INR 21,100/Month. • We provide extensive training which grooms the selected candidates into professional Technical Recruiters. Collabera invests INR 2 Lacs per candidate in providing this training without charging anything to candidate. At the same time, we pay the determined salary to candidates who are in training. Considering this, we are looking for a minimum commitment of 11 Months with the organization. Candidates will be signing Training Agreement of 11 Months. Please find agreement Terms and condition below. 1. The ‘Employee’ agrees to undergo training as and when it will be arranged by the Company. The training shall be conducted in house/ outside as per the discretion of the Company. 2. The Employee shall, on completion of his training forthwith return to the Company and resume duty and shall serve the Company for a minimum period of 11 months from the date of Joining. 3. The Employee further agrees that in case he/she leaves the services of the Company before completion of 11 Months period, Employee undertakes to pay to the Company, an amount of Rs 60,000/- (Rupees Sixty Thousand Only) as liquidated damages.